We’ve released a new update today that fixes a crash introduced by a recent update for windows 10. If you’re suddenly encountering crashes when exporting, please update! We’ve released a new update today that contains security updates. If you’re having issues with Dynamo MC connecting to the internet, please update! We’ve pushed out a new update today that contains fixes for integrating Dynamo MC with third party software. More information about our upcoming third party integration will be coming soon! Finding Dynamo MC useful? Let us know what you thoughts at feedback@dynamoappraiser.com. We’re proud to announce that Dynamo MC now works with ACI, ClickFORMS, and all other modern appraisal software packages that include a PDF Import feature! In addition to exporting the results to TOTAL, you can now choose to export to a PDF document. Then you’ll be able to import that PDF directly into your appraisal report. To get started creating PDF Exports, simply register for a free Dynamo Appraiser account. After registering, you’ll be able to download and try Dynamo MC. Once you’re ready to export your first PDF, you can choose to begin your free 7 day trial subscription. If you choose to continue using Dynamo MC after your free trial expires, you can choose to enter your billing information and renew your subscription at that time. This subscription operates independently of the TOTAL Store. Interested in seeing a sample report? To see what your sample output might look like, just download this sample PDF. Keep in mind that you can use as much or as little of the output in this report as you like. You can also edit the colors, regression options, and many other attributes to fit your preferences. We hope that appraisers that do not use TOTAL will enjoy having Dynamo MC as a tool in their appraising tool belts, and are exciting to hear your feedback. Please let us know what you think at feedback@dynamoappraiser.com. How do I use my Dynamo MC charts in an ENV? Ever had to deliver an appraisal as an AppraisalPort® ENV file within TOTAL? In the newest version of Dynamo MC, we’ve made some improvements that will allow you to finally be able to include all of the generated reports and charts in your ENV reports. Dynamo MC report images have always worked just fine with TOTAL, but due to a compatibility problem within TOTAL, the chart images never really worked when delivering to an ENV. While we wait for the compatibility issue to be fixed, we’ve added a feature that you can use to get around this. To enable ENV compatible output, click on the Tools > Options. Click on the “Charts Step” tab, and you’ll see an option that says “Force ENV compatible output (ignores Output Paper Size setting)”. Check this box, and your chart forms will use forms that look a bit differently than you are used to (but will work great with ENV delivery). 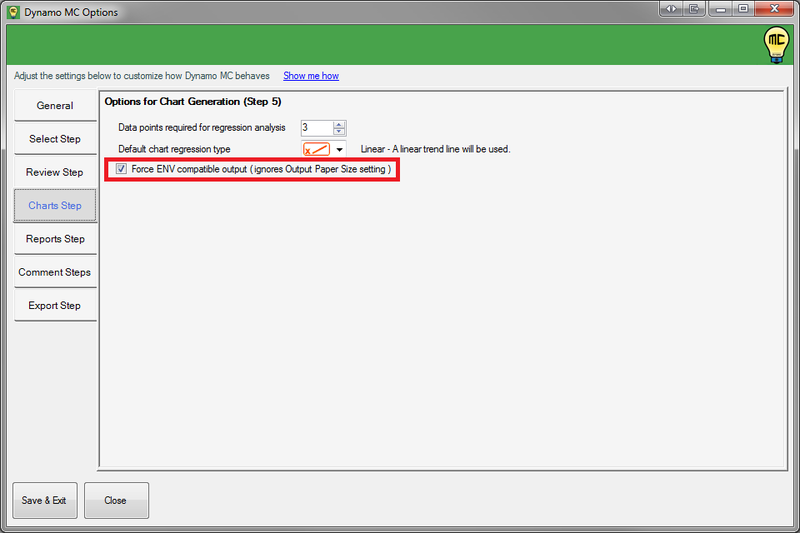 When you deliver your appraisal report as an ENV within TOTAL, you’ll now see that all of your charts are compatible. We’ve also fixed some bugs in the latest version of Dynamo MC (version 1.1.2.0). For more information on what has changed, please check the Change Log. When you start your current version of Dynamo MC, you will be notified of the update and shown a link to the newest installer. Does this update help you get more out of Dynamo MC? Please let us know at feedback@dynamoappraiser.com. The newest version of Dynamo MC now completes the “One-Unit Housing Trends” section in the neighborhood section of the 1004 (page 1). Based on feedback we received, many of the callbacks appraisers receive from reviewers occur because this section does not match what Dynamo MC was putting in the 1004 MC. Now this section will always be in sync with your comparable market analysis. That’s good news for you, as it is one less thing you to have to worry about, and you’ll have fewer callbacks. You can see the calculated trends on the Review step in Dynamo MC before you export your results. If you are interested in why a certain trend was chosen, simply hover your mouse over this section in Dynamo MC, and you’ll see a tool tip explaining why each choice was made. One of the most compelling reasons to use Dynamo MC is to receive fewer callbacks that challenge the market conditions in your appraisals. 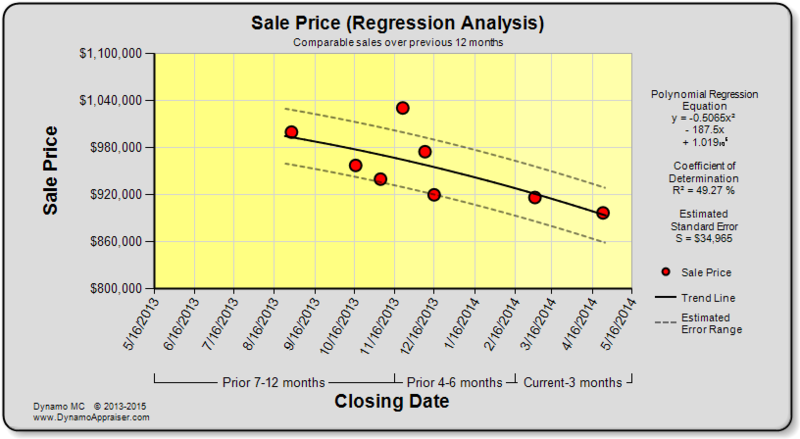 This is done by properly documenting the subject’s comparable market. With a variety of calculations, charts, and graphs available, your analysis of the market with Dynamo MC will be above and beyond what the 1004 MC form can accomplish. AMC reviewers and underwriters will see this analysis in your appraisal report, and they will know that you’ve done your due diligence and have provided more than adequate documentation for the market conditions currently at play. That’s not just less time on the phone. That’s less time modifying and resubmitting your report. Fewer callbacks means your appraisal is accepted sooner, and may help you avoid many of the headaches with deadlines and interested parties checking in on you. Every little bit helps when you only have so much time in a week! We’ve also fixed some small bugs in the latest version of Dynamo MC (version 1.1.1.0) as well, and have made it easier for appraisers to send us information when they need help. For more information on what has changed, please check the Change Log. When you start your current version of Dynamo MC, you will be notified of the update and shown a link to the newest installer. Does this update help prevent you from being bothered by excessive AMC call backs? Please let us know at feedback@dynamoappraiser.com. Dynamo MC now features polynomial appraisal regression (in addition to linear regression). We’ve received a lot of requests for this feature, so we hope you’ll find it useful in your appraisal analysis. Why would this matter? In many markets, the seasonality of the market is a real factor. You may have noticed that buyers don’t like shopping for homes in the winter months, or even that sales slow to a crawl during the holidays. Polynomial regression allows a curved line to be used to explain a market trend, so fluctuations can be explained. This may allow you to better explain the behavior in your market. 1st Order (Linear) – Applies a straight trend line. 2nd Order (Quadratic) – Applies a trend line with a single curve. 3rd Order (Cubic) – Applies a trend line with two curves. 4th Order (Quartic) – Applies a trend line with three curves. Automatic – Dynamo MC will perform a mathematical analysis to automatically select the trend that gives the least amount error. This analysis gives more weight to lower order trend lines to explain the data. You will be able to see a preview for these trend lines before you include them in your report on the chart and report steps in Dynamo MC. 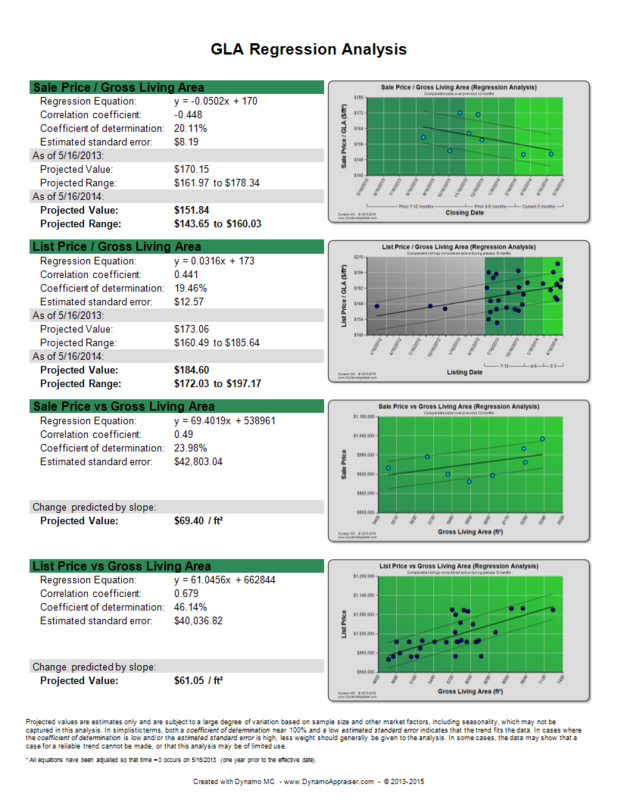 By default, linear regression will be selected for these charts and reports so that they continue to work the way the have previously. 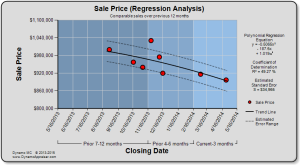 You should always review the charts and reports that are generated when using polynomial regression to make sure that the applied trend makes sense within your market. Have you ever had a hard time seeing the smaller parts of the chart and report previews in Dynamo MC? We’ve implemented a full-screen preview so that you can easily zoom in for a closer view. We’ve added two new color palettes (Spreadsheet and Traditional) based on requests from our users. These are similar to the “Dynamo” color palette, but feature blue and yellow backgrounds. There are other stability and usability improvements in the latest version of Dynamo MC (version 1.1.0.0) as well. For more information on what has changed, please check the Change Log. When you start your current version of Dynamo MC, you will be notified of the update and shown a link to the newest installer. Does this update let you get more out of Dynamo MC? Please let us know at feedback@dynamoappraiser.com. Looking for an easy 1004MC solution? Looking for an easy 1004MC solution? Look no further than Dynamo MC. We are committed to making Dynamo MC the easiest 1004MC tool available to appraisers. In the newest update, we’ve made Dynamo MC even easier by focusing on a few areas that were causing appraisers some trouble. We’ve improved the look of the select step and think you’ll find that the new visuals make it easier to see when your columns in your data are missing. We think you’ll agree that the new icons make it easier to see when there is a problem. It also completely removes the temptation to click on the old check boxes. We’ve also made it easier to send files to our support team directly from within Dynamo MC. 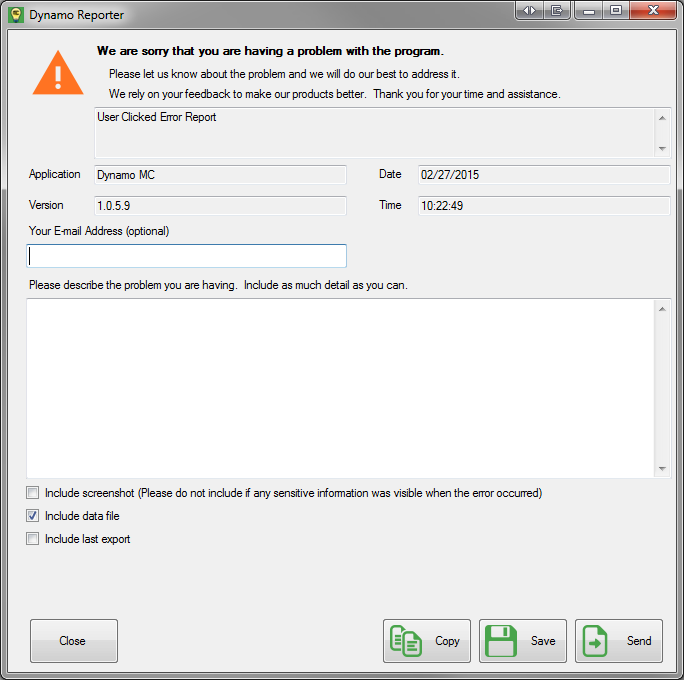 The Dynamo Reporter (available from Help -> Submit Error Report) now can include your currently loaded data file. It also can send your last working export to our support team. Now if you experience an error, you’ll be able to send us everything we need to help in just a few clicks. There are a few other stability and usability improvements in the latest version of Dynamo MC (version 1.0.5.9) as well. For more information on what has changed, please check the Change Log. When you start your current version of Dynamo MC, you will be notified of the update and shown a link to the newest installer. Does this update make it easier for you to use Dynamo MC? Please let us know at feedback@dynamoappraiser.com. 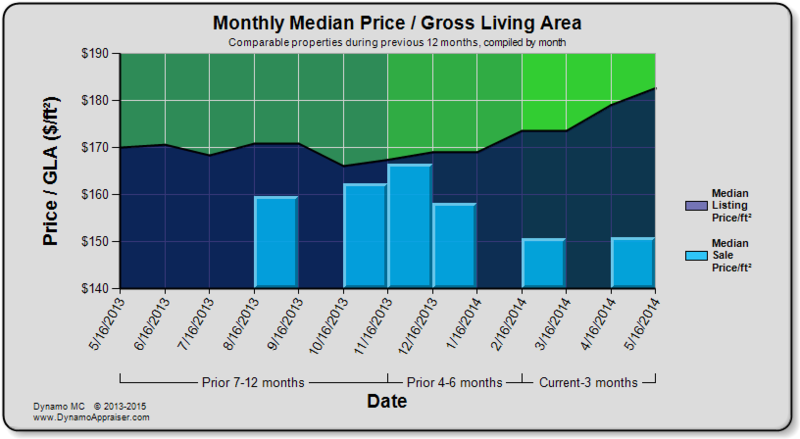 Due to popular demand from appraisers, Dynamo MC can now utilize Gross Living Area (GLA) data. In the newest version of Dynamo MC, 9 charts and 1 report have been added that deal with GLA. 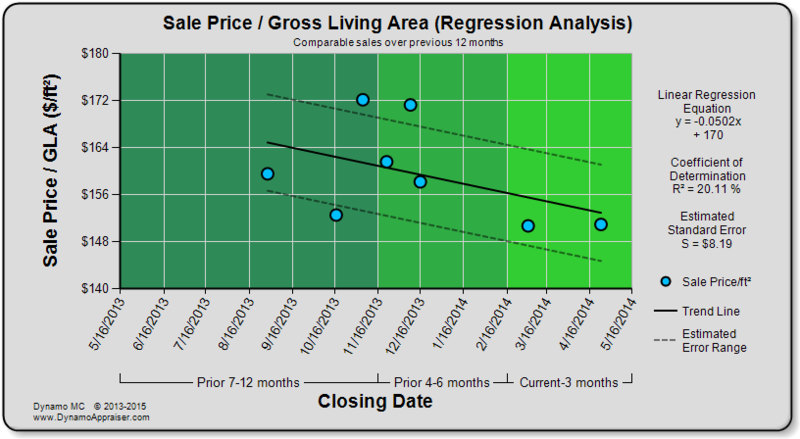 You can use these in your appraisals to provide insight into property value trends and changing price per square foot values. Some of the new charts and reports are shown below. You may notice that some charts now directly compare Price vs GLA. 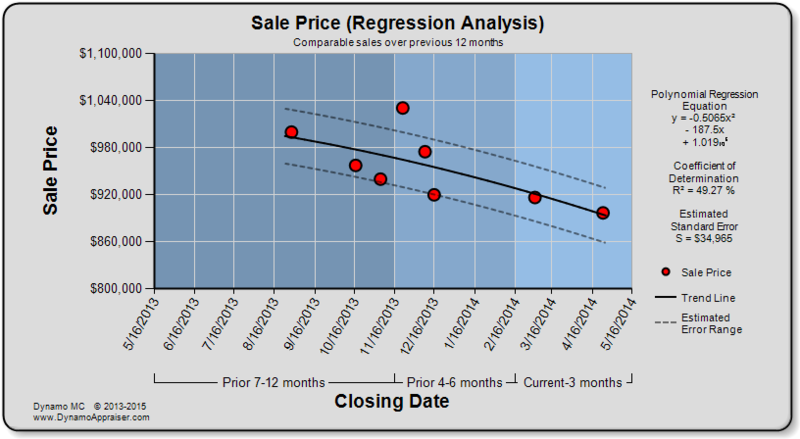 This style of chart can be used to help determine a reasonable GLA adjustment with the right data. 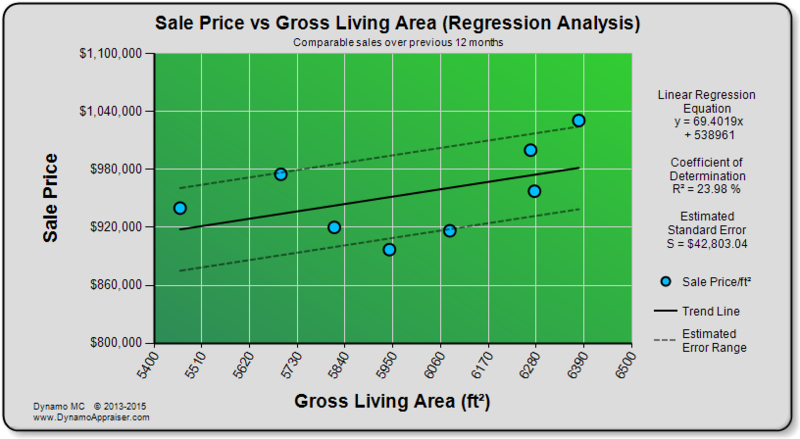 The slope of the line indicates the rate at which the price changes with the size of the living area. 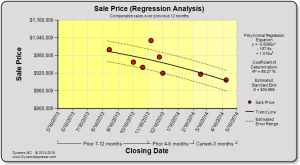 Real Estate Appraiser Gary Kristensen (of A Quality Appraisal, LLC) uses this regression analysis technique to determine Living Area adjustments in his appraisals. He has written multiple articles and created videos to teach this technique to other appraisers. You can learn more in his latest blog post. This same approach can be used with Dynamo MC, but you’ll also have the advantage of better looking charts than you can get with Excel, and you’ll get your results faster too. Note: When choosing GLA from your MLS, please be sure that you are using GLA as an appraiser would define it (the above grade living area only). This ensures that you are comparing apples to apples in your appraisal. If for some reason your MLS only provides data for the total square footage of the properties, please disclose this in your appraisal comments and account for this when considering any results. 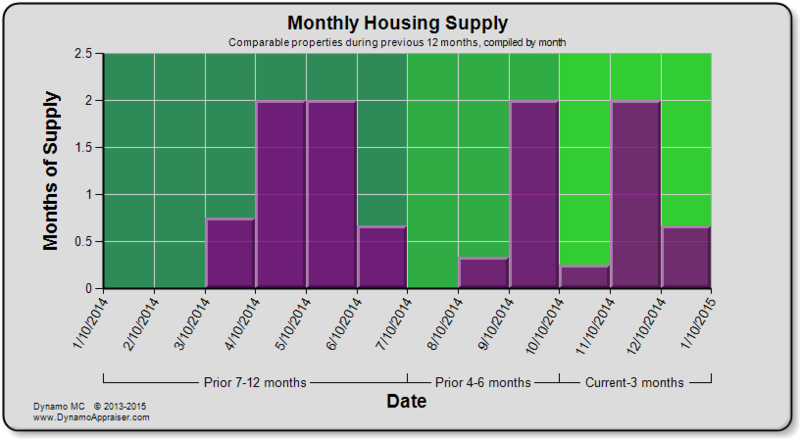 An new chart showing months of housing supply has also been added to provide a monthly breakdown of the inventory available in your market. You’ll find all of this and more in the latest version of Dynamo MC (version 1.0.4.8). For more information on what has changed, please check the Change Log. When you start your current version of Dynamo MC, you will be notified of the update and shown a link to the newest installer. a la mode issued a press release today welcoming Dynamo MC to the TOTAL Store. You can read the full announcement below. The original copy appears here. Jan. 26, 2015 — Naples, FL — a la mode announced today that Perfectly Normal Software LLC’s Dynamo MC is available in their TOTAL Store and fully integrated with a la mode’s full range of appraisal formfilling systems. Dynamo MC is a step-by-step MLS import tool that automatically populates data into the entire Fannie Mae 1004MC form in TOTAL. The tool also generates charts, includes a powerful editor to customize comments, and has built-in regression analysis. The TOTAL Store, and the associated integration APIs, allow third-party vendors to seamlessly integrate into the underlying TOTAL product architecture for a superior customer experience, all while avoiding the delays of traditional integration deal negotiations. TOTAL products are used by more of the nation’s real estate appraisers than all other competing software applications combined, so inclusion in the TOTAL Store is essential to reaching the vast majority of real estate appraisers. Dynamo MC is currently integrated with a la mode’s TOTAL and its legacy WinTOTAL system. For more information, visit www.alamode.com/TOTALStore. A mission-critical technology leader in the financial technology industry for more than 29 years, a la mode’s products are used by hundreds of thousands of professionals to power more than 50% of all US real estate transactions. In the lending sector, a la mode’s Mercury Network subsidiary (http://www.mercuryvmp.com) is the vendor management platform for more than 20,000 transactions a day, serving over 600 lenders and AMCs. In the real estate sales and financing industry, a la mode’s Pipeline ROI division (http://www.pipelineroi.com) hosts the only comprehensive inbound marketing platform, attracting and managing leads for tens of thousands of brokers, agents, and mortgage professionals. And in the appraisal market, a la mode’s flagship TOTAL software line (http://www.alamode.com) is the dominant production system, used by more appraisers than all other brands combined. a la mode is headquartered in Naples, FL, with additional offices and more than 200 employees located in Oklahoma City, Salt Lake City, Atlanta, and Washington, DC. For more information about the company, visit http://www.alamode.com. Company founder Bob Cirilli is both an appraiser and a computer engineer, which gives him a diverse perspective on the challenges that appraisers face as technology advances. To help meet these challenges, he launched the Dynamo Appraiser brand with its first product, Dynamo MC. Dynamo Appraiser embraces the belief that while automation can never replace an appraiser’s expertise, it certainly can save appraisers some time every once in a while.